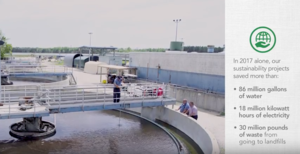 SMITHFIELD, Va., May 08 /CSRwire/ - Today, Smithfield Foods, Inc. announced the release of the Environment section of its 17th sustainability report. This section, the second installment in the report, highlights the company’s ambitious goal to reduce greenhouse gas (GHG) emissions and its progress toward its 2020 environmental targets. Innovative practices and platforms, including Smithfield Renewables, to help the company achieve its commitment to reducing GHG emissions 25 percent by 2025 throughout its entire supply chain – the first commitment of its kind by a protein company. Eight certified zero-waste-to-landfill facilities that save the company nearly $273,000 per year, with five more facilities expected to be certified by the end of 2018. Projects recognized by our internal awards program that reduced water use by more than 86 million gallons and diverted more than 30 million pounds of waste from landfills in 2017. These, along with other environmental achievements, helped Smithfield save an estimated $128 million over the past five years in operating costs. Eighty third-party awards recognizing environmental sustainability achievements in 2017. As described in the new report, Smithfield’s environmental efforts extend throughout its supply chain. This includes the farms that grow feed grain for its hogs, the farming operations that raise the animals, the processing facilities, and finally the transportation network that delivers finished products to retail stores and restaurants. The company works within its supply chain to ensure that the products provided to consumers are high quality and produced in a responsible manner. The Environment section is the second of a multiphase release of Smithfield’s 2017 Sustainability Report, following Animal Care that was released last week. Smithfield will publish its Food Safety and Quality section next, followed by the Helping Communities and People sections, as well as the full report. To view an introductory video about Smithfield’s commitment to the Environment, click here. This new section of the report is now available at smithfieldfoods.com/environment.